Roman Emperor Diocletian, having abdicated his throne in AD 305, decided to spend the last years of his life in Dalmatia and built a palace for that purpose on the bay of Aspalathos, on the south side of a peninsula extending into the Adriatic Sea. The spot he chose is now the very heart of the city of Split and the palace is still one of the city's main tourist attractions. 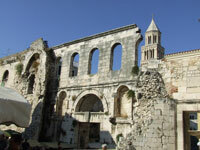 The building and the entire historic Split inner city area around it have been declared a UNESCO World Heritage Site. Within the palace walls are a network of narrow cobblestone alleyways that house a mixture of residential apartments, modern shops, cafes and restaurants, ancient Roman relics, and a magnificent cathedral. The palace is interesting in that it was designed to combine a luxurious residence with the defences of a military camp, having towers and fortifications on its landward sides with three monumental gates. Originally situated on the water, the palace is now fronted by the city's popular waterfront promenade and faces onto the harbour. The buildings are made from local white limestone, quarried on the nearby island of Brac.